Economic Growth (GDP) GDP is expected to grow by 4.9% driven by the strength of domestic economy according to a research unit of SCB Bank. 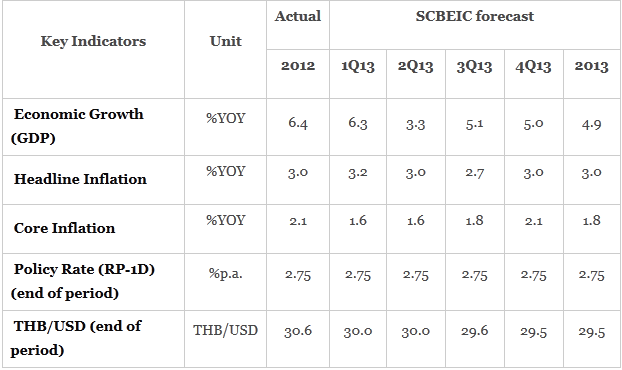 Thailand’s domestic demand is expected to grow well. Private sector’s consumption spending expanded by 6.6% in 2012, a very high number, demonstrating the strength of domestic demand. The strong consumption spending momentum should carry into 2013 with supports from the increase in the daily minimum wage to 300 baht that began in January, and the purchases of cars under the first car scheme late in 2012 that will result in deliveries in 2013. January’s export figure stood at 18.3 billion USD, almost no change from the previous month, highlighting the continued weakness in purchasing power from abroad. Risks to the global economy have receded. Although Europe is enduring a recession, overall economic sentiment has improved, with lower volatility in the financial markets. The main risk to the global economy in the next 1-2 months is the negotiation regarding spending cuts (sequestration) of the U.S. government. If that falters, the spending cuts will likely dampen the progress of the U.S. economy. However, the impact to the global economy will not be very significant. Global crude oil price should remain stable due to a sluggish global economy. The Brent crude oil price should average around 110 USD/barrel in 2013, almost no change from the average of 111 USD/barrel in 2012. As a result, the inflation risk from energy price is relatively low. Domestic energy prices depend on government policy. Energy policy that has been announced earlier, such as the gradual hike in LPG and NGV prices, should be monitored. The direct impact to headline inflation is expected to be small. As for the core inflation, it is expected to remain stable and stay comfortably within the Bank of Thailand’s target range of 0.5%-3%. Policy Interest Rate Thai Baht The policy rate is expected to stay at 2.75% in 2013 . The global economy remains sluggish, but the domestic economy is stronger than previously expected. Notwithstanding the slow exports, the pace of domestic spending especially household’s consumption spending has been exceeding expectations, meaning that the risk to growth for the Thai economy is rather low. Capital flows should be monitored. Capital inflows have slowed down in February after massive inflows into short-dated bond markets in January. However, the risk from capital inflows remains as liquidity from the U.S. Federal Reserve in the amount of 85 billion USD a month, which is larger than that of QE2, continues to enter the financial markets in 2013. Moreover, there will be further liquidity from the Bank of Japan. Thus, the risk from capital flows continues to warrant monitoring. The Thai Baht is expected to strengthen from capital inflows. Keep monitoring capital inflows and the Bank of Thailand’s response. Liquidity from the U.S. Federal Reserve as well as the Bank of Japan will continue to enter the financial markets in 2013, likely resulting in further appreciation of most Asian currencies, including the Thai baht. The pace of appreciation will also depend on the Bank of Thailand’s policy responses, such as encouraging more outward investment by Thai individuals and corporates, i.e. whether those will create a balance between inflows and outflows, and dampen the impact on the currency. Be mindful of volatility in the short term. The main factors affecting investors’ sentiment in the next 1-2 are the negotiation regarding spending cuts (sequestration) of the U.S. government, and expectations regarding the exit from QE policy of the U.S. Federal Reserve.